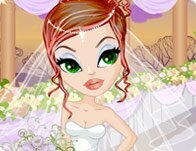 Description: Although it's not particularly romantic to propose without a wedding ring and then bring your fiance to the jewelry store to pick out their own engagement ring, it is pretty smart! Now this handsome boyfriend doesn't have to spend thousands of dollars on a diamond ring to find out she hates diamonds! Help them dress up and pick out the ring they'll share for the rest of their lives.